I know, I know what you must be thinking. Such a low grade for The Bell Jar? Isn’t this the holy grail of feminism? Isn’t it considered a classic? It might be considered a classic, but in my opinion, it is not deserving of that title. My experience of reading it lead me to conclude that it lacks depth. That might not be your experience but in my view, this chaotical and illogical narrative featuring a protagonist that isn’t exactly sympathetic, doesn’t have much going for it. Moreover, I think Sylvia must have been at least slightly embarrassed of it herself, that is why she allegedly published it under a pseudonym. Plath wanted it to be distinct from her other more serious (and in my view, much better) writing and she reportedly referred to this novel as a potboiler- something that addressed the popular tastes of the day. She wanted to create something that would sell. In her journal, she wrote how there is a real market for literature focusing on hospital and mental illnesses and that she was a fool if she didn't take advantage of it (i.e. use her own personal experiences to write the novel). This lead to her writing this semi-autobiographical novel, which she according to her husband, wrote fairly quickly. She found a British published sooner than an American one. One editor wrote to her: “We didn’t feel that you had managed to use your materials successfully in a novelistic way.” That’s exactly my opinion as well. On the other hand, in one letter to her mother, Plath wrote that she needed to write this novel to get over her past experiences. That might be additional motivation, but if it was therapeutic for Plath (which I doubt because she killed herself shortly after), it doesn't mean it will be therapeutical for the reader. The Bell Jar doesn’t feel like a novel. I had to do a lot of research to make myself believe that it was actually published prior to her death. I was so sure that it was an unfinished novel, that it was published by mistake- even after reading otherwise. But no, Sylvia did see this novel published in UK, she just didn’t deem it worthy of her name. Rightly so, I might add, for she was so much better than this novel, capable of writing much better. My initial thoughts were that the only reason why she has written a novel of such a poor quality was that she was mentally ill when she was writing it. Then I remembered that she wrote most of her poetry while she was depressed but her poetry is exceptional nevertheless. She was obviously capable of writing well even while she was depressed. Now, that I know that she probably wrote it for financial reasons, I understand some things better. I still think we shouldn’t appreciate her poetry less on account of this poorly written novel. Whatever were her reasons for writing it, I will continue to see this novel separately from her powerful poems and will never think less of them. There are many autobiographical elements in The Bell Jar (Plath even included entire episodes from her own life- google it if you want to know exactly how and where) but somehow they don’t make the novel seem more real. The narrative is told from a point of view of Esther, a young (supposedly brilliant- though this is not exactly manifested in the novel) woman. The novel opens with Esther’s trip to New York and is based on Plath’s personal experience as a guest editor of Mademoiselle. Anyhow, the character of Esther Goodwood find herself somewhat at crossroads. She is not sure what she will do with herself. Being an accomplished student, miss Greenwood always imagined an amazing future for herself but now she is not so sure. I do think that first part of the novel had potential and it is something that many people can relate to- that feeling when you’re leaving University and you have no idea what life installs for you. What was odd, however, was the way that Esther seems to observe other young ladies who try to befriend her (for example Doreen) from some distance. I found it very hard to relate to Esther on account of this. For example, her friend Doreen appears at Esther’s door but Esther closes down the door on her, leaving her to vomit on the hallway and is glad when she is gone by the morning. Shortly after, Doreen experienced food poisoning and enjoy is because she likes other people (Doreen included) to fuss over her and take care of her. Perhaps because this Esther’s the best chance at intimacy and the only time when Esther is not able to puss other away. The second part of the novel, one that describes her breakdown and treatment is also founded on Plath’s personal experiences. Somewhere along the way, her psychiatric treatment begins. This novel is considered a critique of a patriarchal society and also a warning against bad treatment of women in psychiatric institutions. Why I can see certainly see why these themes are important, I can't say that the novel addressed them in the right way. I will explain what my problem with this novel is as soon as I include this spoiler alert. This part of review is infested with spoilers, so do skip it if you didn’t read this one. I don’t go into details about the plot (not that there is much of a plot anyway) but I shall reference events that have occurred in different stages of the novel, so if you want to dive in not knowing anything- skip this part! Here is my problem with The Bell Jar. We have a protagonist who is completely self- obsessed to the point it is sickening and frankly it seems to border with sociopath behaviour. Esther moans and moans about everything. Her narrative is a succession of never ending complaints. She hates everyone and everything. Apparently, nobody is good enough for her. Oddly enough, that’s not even the worst part of the novel. As irritating as that might have been, it could have been overlooked if there wasn’t for something else, something much more sinister. Do you know what scares me the most? Esther’s attitude towards other women. No, it is not her shyness that is keeping her away from establishing something that would even remotely resemble a friendly relationship with other women. It is her negative view of women. I didn’t notice that Esther had some speech defect or social anxiety that would prevent from communicating with her own gender, she is, for example, very eloquent when it comes to deceiving her professors so that she wouldn’t have to study for a class she hates. When it benefits her, she can be eloquent, so I don’t think that she can get away with an excuse of being an introvert/shy. If there is a woman Esther likes, she must be some poetess dead for centuries, at any rate no women living in her present time is worthy of her attention or God forbid friendship. God forbit that Esther feels any sympathy for any other women or even considers her worthy of a thought. Patriarchal society is the devil. Women? They’re a step lower than that, something so lowly that it doesn’t even deserve a name. With the exception of Esther, she is the best thing that has ever happened to this world, but we faulty humans, fail to grasp her greatness. How will she ever punish us? Why, by taking herself away from us. Goodbye, cruel world, I was always too grand for you. Let’s look at Esther’s life for a second. She was raised by a single mother who in the course of this novel acts very lovingly towards her. Yes, she tries to make her think about practical things- but what women doesn’t do that? Ester hates her mother and enjoys making her life’s miserable. Why? Ok, let’s that one slip. Is there a single female character in this whole novel that Esther cares about? Forget that. Is there any character of any gender that she cares about (expect herself)? Does she ever stop to wonder how someone else might feel? Does she care about others? Is she ever emphatic? This book makes me sad but it was not Esther I felt for, but those around her. I only felt sad in a general way, because the bad treatment of mental patients would make everyone feel down. Mostly, I felt sad because I know that there are women like Esther. Women making things hard for other women. Women making other women feel bad about the fact they are- women. Women criticizing other women nonstop. Women who deep inside hate themselves because they are- women. I’ve felt this attitude many times, usually I just ignore such women and focus my attention on all those smart, intelligent and amazing women in this world- and there are plenty of those. Don’t let anyone try to convince otherwise. I don’t think it is normal to be an adult woman and dislike every single person of your own gender that you come across with. It is not like she came across any really bad women. Some weren’t the brightest, and Esther much enjoyed making fun of those, but did any actually tried to harm her? Somebody expected her to make a summer job because she was a student? How dare they! Basters?! Esther is all that, she is incredibly intelligent and she can’t possibly degrade herself with a summer job, better to refuse to wash her hair – that will teach a patriarchal society a lesson. Was there a single woman in this novel that tried to do her serious harm? Weren’t many of them in fact friendly? It is not really fair to see them as lower beings just because they are not (or so we're made to think) as smart as Esther. As for Esther’s finance Buddy, I’m sorry but didn’t she chose him herself? Didn’t she feel smug about it? Didn’t she feel that she finally belongs to society now, didn’t she felt more accept among other students because she had a serious boyfriend? Just like the protagonist of The Catcher in The Rye Esther desperately wants to belong to the society but at the same time she detests it. She wants to be able to look everyone from above, but she also wants to feel loved and accepted. She is like those poor people who talk endlessly about the corruption of the wealthy ones, but would jump at the first change if somebody invented them to the society of the rich. What is that called again? Yes, a hypocrite. Most analysis says that Esther is very self-critical and that makes her different from other people. To me her self- criticism doesn't seen genuine, it seems more like passive- aggessive behaviour, punishing others by punishing herself. I might be wrong, but that way my impression. Esther shows great motivation to impress men through her actions, no matter what she may claim. She never complains to them or reveals what she thinks about them. She spends endless hours analysing every word that her finance said and elaborates on what kind of moron he is. Girl, is he holding a gun to your head and making you date him? I don’t think so. So, you’re not happy with him. Leave him. Or I have a crazy idea! Talk to him, tell him that you’re not happy with the way he treats her. How could she do that? That she couldn’t spent all her time feeling sorry for herself. Esther, my compliments- you’re the victim of the year! Truth be told, her finance is no angel. Nevertheless, it should be noted she never gave him a real shot- not anyone for that matter. She doesn’t trust anyone because she is better than everyone. She has ambition, and a lot of A’s. In fact, it may be because she wants to be a man, but is conflicted about it for obvious problem. Or perhaps it is not exactly that - maybe she wants freedom. Unfortunately, there isn't much of that in this world, neither for man, nor for women. Nobody has it easy. IS ESTHER SUPPOSED TO BE SYVIA PLATH? Well, Plath admitted to the novel being autobiographical, but that doesn't mean we should fall into trap of disliking Syvia for the actions of her character. I’m not equalling Esther to Sylvia, even if there are some autobiographical elements. I’m sure that Sylvia was much more likeable than Esther, at any rate she was obviously intelligent and talented. Esther’s intelligence and sensitivity are referenced in the novel, but they’re not actually elaborated on. She fails to move me as a person. Sylvia moves me, I do feel for her, but for Esther? Not one bit. Fortunately, Sylvia isn’t Esther and all my views about Esther don’t any way reflect my views on Plath. Speaking of which, we shouldn’t stigmatize people with mental illnesses but we shouldn't idolize them either. Let's address the elephant in the room, that is Plath's illness. I already said I'm not sure how much her depression affected her writing process, but this novel is very depressive. I don’t think it is fair to criticize Plath as a person, on account of her mental illness, because mental illness is something that can happen to everyone. You can’t blame someone for suffering from a mental illness. Nobody wants to be ill that way. Nobody should be. Nevertheless, I failed to understand why people try to make her suicide seem an act of courage. It is not. I find it hard to look up to a person who killed herself with her two kids in the other room. I don’t see why we should idolize such acts and romanticize them. Why should we court anyone's suicidal daydreams? Doesn’t this in fact increase the rate of suicides? We shouldn't judge suicides but we shouldn't turn them into heroes either- for obvious reasons. Needless to say, in a culture that celebrates suicide, young will be made to think it is something noteable to do. Let's no go that way. WHY AM I GIVING IT 3 STARS EVEN IF I DISLIKED IT? I read this book years ago. One of my professor (who was obviously fascinated with Plath as most literary professors are) gave it to me saying that she wasn’t able to finish it because it was so devastating and emotionally difficult to read. I found it difficult to read but not because of the topic. If anything, I failed to feel for the novel's narrator/protagonist. 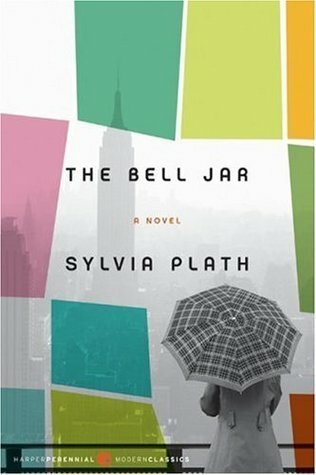 Prior to reading The Bell Jar, I had read her poetry and quite liked it, but I didn't like The Bell Jar. I do still think that Plath was a talented woman and a brilliant poet, but I don't feel a need to place her on pedestal and bow before her just because her life ended tragically. To put it quite simply, to me this novel didn't make much sense.vI will give it 3 stars because it made me think a great deal and any books that troubles me as much deserves at least that. Perhaps there is a layer to this novel that I have missed. WAS THE INITIAL RECEPTION OF THIS NOVEL JUSTIFIED? Original reviews of this novel were lukewarm, but nobody knew who wrote it back then. It makes me wonder how we would feel about this book if it was not Plath's name on the cover. I can help but wonder what if....What if Sylvia never killed herself? Would she have EVEN let us know that she is the author of this novel or would she had kept it a secret? Would she go on to write better things? Ironically, it was her suicide that gave this novel its life. Perhaps that is why I dislike it. It is not that this novel killed her, but I feel like it took an unfair advantage of her death. I suspect that much of the praise The Bell Jar got was to make up for Plath's suicide, like our belated praise will do her any good. If The Bell Jar is the only thing you’ve read by Plath and you ended up hating it, please give Plath another chance. Her poetry is really much better than this. If you are her fan and you hated this one, don’t feel too bad, you're hardly the only one. If you have read The Bell Jar and loved it, please explain to me- why did you like it? Let me ask you a question: Are you sure you would like it as much if you didn't know it was written by Plath? Sign into Goodreads to see if any of your friends have read The Bell Jar. david wrote: "ah, I must read this book. I forgot." It is not her best work. Such a long and detailed review, it's amazing <3 It's okay to not like a book as much as other people or you expected to! I d think this one is a shame that you feel it is missing the depth.